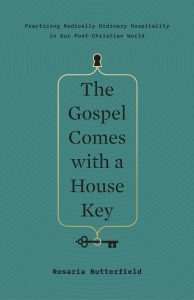 “What does the conservative Bible-believing family who lives across the street do in a crisis of this magnitude?” Rosaria Butterfield asks in her new book, The Gospel Comes with a House Key: Practicing Radically Ordinary Hospitality in Our Post-Christian World [review]. She has just described the day that her neighbor across the street, a man whom she and her family had painstakingly become friends with over years, was arrested for cooking meth in his house. “We could barrack ourselves in the house, remind ourselves and our children that ‘evil company perverts’ (see 1 Cor. 15:33), and, like the good Pharisees that we are always poised to become, thank God that we are not like evil meth addicts,” she says. If you know anything about Butterfield, it’s probably because you’ve read or know of her book The Secret Thoughts of an Unlikely Convert, which chronicles her conversion to Christianity as an out lesbian English professor nearly 20 years ago. Secret Thoughts was responsible for putting the pastor’s wife, mother, and former tenured academic on the lecture circuit about sexual ethics over the past six years. Her newest release shows that she has much more to say. In this book, she argues that an open-door attitude and a purposefully hospitable lifestyle is the missing link between Christians and the watching world. I was deeply affected and thoroughly convicted by the book and excited to have an opportunity to ask Butterfield some questions. What role did hospitality play in your willingness to hear the gospel? It made all the difference in the world—literally. Before I met Ken and Floy Smith, I understood the gospel as a metanarrative that depended on both ignorance and privilege. I did not see how God’s love could hold up next to poverty, child abuse, racism, and violence. I did not see how the “good news” could be good for someone like me—an out lesbian feminist. It seemed like the gospel’s good news was only good for people who already fit into a politically conservative worldview, people who never had to worry about the things I had to worry about. Also, the gospel’s main point—that Jesus will save me from my sins—had no receptor point for the postmodern, Rousseau-abiding thinker I once was. What I needed—and what I learned in the home of Ken and Floy Smith—was that I was an image bearer of a holy God and that such an identity came with responsibility as well as blessing. Weekly meals at the Smith house, followed by Bible study and psalm-singing and meeting other Christians who did not fit the stereotype, forced me to ask the question that would lead to my undoing: Am I a lesbian? Is lesbian who I am (inherently, ontologically, really), or is lesbian how I feel (descriptively speaking)? Further, since the Christian worldview sees this life on earth as the middle chapters of reality, I had to grapple with whether my eternal soul was gay—and what that could possibly mean. The gospel message—that Jesus has come to save you from your sins—seemed irrelevant to me. But the imago Dei was intriguing. It conflicted with my postmodern worldview, but even in conflict, it had a landing pad. How can we love our neighbors without leading them to think we approve of everything they do? The secret to this is spending enough real time with people so they know you well enough to know how you handle disagreement and difference. This really shouldn’t trip up Christians. Christians have a theology and worldview for calling strangers to the table, and then sitting there long enough to be both earthly and spiritual good. Christians have a theology of difference and diversity. What trips up Christians is this: too much time waging war with people and ideas on social media, and too heavy a reliance on church programs to filter strangers, weeding out the creepy ones and bringing to your table the nice and safe ones. This post-Christian world won’t stand for this. And we shouldn’t either. Get close enough to the stranger to put her hand into the hand of the Savior. What are some ways Christians often misunderstand hospitality? Counterfeit hospitality comes with strings; Christian hospitality comes with strangers becoming neighbors becoming family of God. Counterfeit hospitality seeks to impress and entertain. Counterfeit hospitality separates host and guest in ways that allow no blending of the two roles. It separates people into noble givers and needy receivers, or hired givers and privileged receivers. Counterfeit hospitality comes with strings; Christian hospitality comes with strangers becoming neighbors becoming family of God. When you began your marriage, how did you and your husband develop a vision together for your evangelistic hospitality? First, there is a subtle but important difference between evangelistic hospitality and radically ordinary hospitality. Evangelistic hospitality is done for the need of the lost. Radically ordinary hospitality is done for the good of everyone—the host included. Evangelistic hospitality burns out when people don’t respond to the gospel with saving faith. Radically ordinary hospitality lives out your transparent, authentic faith before the watching world, knowing that too many people are dying of crushing loneliness, both within the church and without, and taking comfort in being both earthly and spiritual good to others. Finally, evangelistic hospitality focuses on saving faith. Radically ordinary hospitality focuses on bearing the image of God. It seeks to simultaneously build up the family of God as it adds and includes those who do not yet know Christ. Now, to your question! Kent and I developed a vision together as part of the logical outgrowth of daily family devotions and daily prayer. Kent and I were both—for at least a decade of marriage—the only two believers from either side of our extended families. We desperately wanted our family members to know Christ, and this love and longing extended to our neighbors. Kent and I were both radically converted, and that experience has made us less afraid of people. We remember being outsiders, outcasts, and strangers. We recognize strangers as our kin. When Kent’s first pastorate was as a church planter, radically ordinary hospitality was a necessary way of life, as the home of a church planter (or missionary) is the bridge to the church. And some people need to park on the bridge longer than others. From day one of our married life, Kent has been my faithful spiritual head, and we have always fled together to the means of grace to guide us as we open our home and hearts to others. Is “radically ordinary hospitality” something every Christian is called to in every season of life? No. There are seasons of life where such openness would be impossible. When we had just adopted a teenager out of foster care and she was deep in grief and anger, or when my aged mother was dying of cancer, well, during such times our doors were closed, and we were caring for our own. The key word in your question is “season.” Seasons are supposed to change. Another key issue is this: radically ordinary hospitality is never convenient. A good question to ask yourself: What is the difference between inconvenient and impossible? Radically ordinary hospitality is never convenient. A good question to ask yourself: What is the difference between inconvenient and impossible? Also, practicing radically ordinary hospitality doesn’t mean that your home is the place where this happens. Perhaps someone else in the church has a home that is a better fit—perhaps its location is more central or open. (In general, the size of the home is not a barrier to hospitality, but its location may be.) Well, if you go to this sister’s house and become a stakeholder in the hospitality that takes place there, you’re still practicing hospitality. Host and guest are fluid positions, and radically ordinary hospitality requires many hands, many hosts, many guests, and much grace from God. Tilly Dillehay is wife to Justin and mom to Norah and Agnes. She is the author of Seeing Green: Don’t Let Envy Color Your Joy, and she blogs with her husband at While We Wait. What’s the Connection Between Hospitality and Evangelism?